Today, we have conducted hearing of a very important application before the International Crimes Tribunal. In the 200 years history of British India, 25 year history of Pakistan and in the long 40 year history of Bangladesh, no precedent exists of such an applicationever being moved. In order to ensure a fair trial, a Judge has to remain above and beyond all controversy. If a Judge is even remotely involved with the subject matter of the proceedings, then he has to refrain from acting as a Judge in the said proceedings – this is a time honoured principle observed by all Judges. But for the first time in the history of Bangladesh, we see an exception to this time honoured principle in theproceedings of the International Crimes Tribunal, Dhaka. On 25th March 2010, the Hon’ble President appointed Mr. Justice Nizamul Haque Nasim as Chairman of the International Crimes Tribunal. Earlier in 2001, he was appointed as an Additional Judge of the High Court Division of the Supreme Court of Bangladesh. On 26th March 1993, a People’s Inquiry Commission was constituted to conduct an investigation into war crime atrocities committed in 1971. A 40-member Secretariat was also constituted to assist the People’s Inquiry Commission in its investigation. Mr. Justice Nizamul Haque Nasim was a member of the Secretariat of the People’s Inquiry Commission. On 26th March 1994, the People’s Inquiry Commission submitted its investigation report. As a member of the Secretariat of the Inquiry Commission, Mr. Justice Nasim assisted the Commission in the investigating into allegations of war crimes against Mr. Moulana Motiur Rahman Nizami, Moulana Delwar Hossain Sayedee, Mr. Salahuddin Quader Chowdhury, Mr. Ali Ahsan Md. Mujahid and several other leaders of the BNP and Bangladesh Jamaat-e-Islami. As a member of the Secretariat of the People’s Inquiry Commission, Mr. Justice Nasim was involved in theinvestigation of war crimes allegations against the aforesaid persons. He was also involved in the process of obtaining statements of witnesses, many of whomare likely appear before the Tribunal to give evidence. In his capacity as a member of the Secretariat, he also recommended that the aforesaid persons be tried for war crimes by the International Crimes Tribunal. In view of Mr. Justice Nasim’s direct involvement withthe People’s Inquiry Commission, he has no right to perform the functions of the Chairman of the International Crimes Tribunal. Mr. Razzaq further submitted that if Mr. Justice Nasim does not resign, this will amount to obstructing the course of justice. ‘Mr. Justice Nasim has no constitutional, legal or moral right to remain as Chairman of the Tribunal’, he said. ‘The sooner he resigns the better’. 1. Today we are addressing the press on a matter of high public importance. Our concern is to maintain the independence, the impartiality and the dignity of the judiciary. 2. Mr. Justice Md. Nizamul Haque Nasim is a serving Judge of the High Court Division of the Supreme Court of Bangladesh. On 25th March 2010, he was appointed as Chairman of the International Crimes Tribunal, Dhaka. Under his chairmanship, the ICT has started proceedings for war crimes against two former Ministers of BNP and 5 leaders of Bangladesh Jamaat-e-Islami, including two former Ministers. 3. 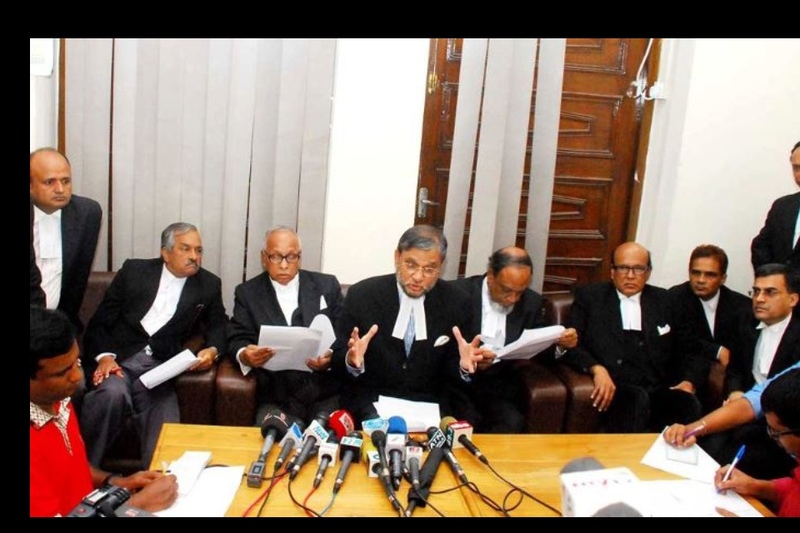 Recently the Prosecution has submitted some documents from which it appears that Mr. Justice Nizamul Haque Nasim in 1994 (when he was an Advocate of the Supreme Court) was a member of the Secretariat of the People’s Inquiry Commission formed with a view to investigating into the alleged war crimes by the aforesaid leaders of BNP and Jamaat. 4. On 27th October 2011, the defence filed an application for the recusal of Mr. Justice Nizamul Haque on the ground of his involvement with the investigation of the self same matter of which he is now a judge. The defence case was that the involvement of Mr Justice Nizamul Huq in th e investigation in 1994 has been proved conclusively by the documents submitted by the prosecution. This very important contention of the defence has remained uncontroverted. On 13th November 2011, a day-long hearing took place before a two member Tribunal in the absence of the Chairman, Mr. Justice Nizamul Huq. 5. In support of their application, the defence relied upon the Constitution of Bangladesh, the oath of office of Supreme Court Judges, the Code of Conduct for Judges of the Supreme Court prepared by and under the authority of Article 96(4) of the Constitution, the Universal Declaration of Human Rights, the International Covenant on Civil and Political Rights the Rome Statute of the International Criminal Court, (all of which has been adopted by Bangladesh), and relied upon various decisions of the superior courts, including one from the House of Lords. It was also shown from the prosecution documents that a number of the charged framed by the Tribunal against Maulana Sayedee were based on allegations made in a Report prepared from information/evidence collected by Mr. Nizamul Huq. 6. On 14th November 2011, the two member Tribunal in their judgment (without entering into the merits of the matter) left it to the “good conscience” of the Chairman as to whether he will recuse himself or not. The Tribunal refused to look into the question of bias of the Chairman, on the technical ground that as co-Members of the same Tribunal they lacked jurisdiction. 7. Although the Defence has made direct and specific allegations of bias against the Chairman of the Tribunal in its lengthy submission, the Tribunal DID NOT clear the Chairman of the allegations of bias. Instead, they have entrusted the responsibility on the Chairman to take a decision. This – we believe – is a right course of action taken by the Tribunal. 8. It was the expectation of the members of the Bar, irrespective of political opinions (we dare say that there is a consensus among the right thinking people of society) that Mr. Justice Nasim should resign from the post of Chairman of the Tribunal. Surprisingly, he has not. On the other hand, today, he sat in the Tribunal and passed an order on an application for review of the charge framing order prompting the counsels representing the Defence to walk out. This is not only unfortunate but unprecedented as well. 9. Mr. Justice Nasim is an honourable man. He is a Judge of the highest court of the country. Since admittedly, he was involved with the investigation of the alleged crimes committed by the leaders of the two main opposition parties, by applying all civilized norms, he should have recused himself immediately. He has no legal or moral authority to remain as Chairman. He is relying on a mere technicality to cling to the post of Chairman of the Tribunal. 10. We call upon Mr. Justice Nasim to resign and resign now. By clinging to the post of Chairman, he has polluted the fountain of justice, brought disrepute to the judiciary, shaken public confidence in the administration of justice – which will have far reaching, disastrous consequences not only in the administration of justice but to the country at large. Moreover, it will be highly prejudicial to the Prosecution, and a great embarrassment for the government. We fear in the coming weeks and months, the continuation of Mr. Justice Nasim will lead to a chain of unforeseen and unfortunate events. 11. We therefore finally make an impassioned plea to Mr. Justice Nizamul Huq to recuse himself immediately.